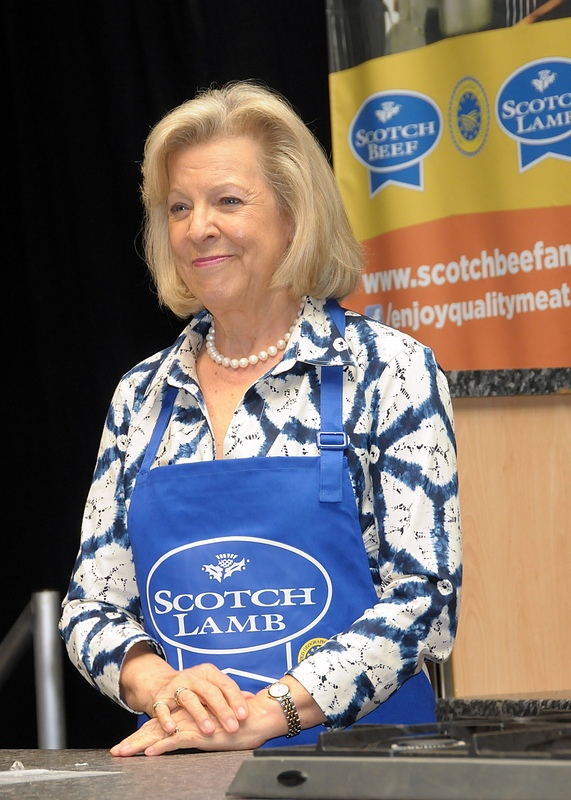 One of Scotland’s best-known cooks and food writers, Lady Claire Macdonald OBE, is set to put Scotch Blackface Lamb on the menu when she visits Dalmally Mart for the first time this week. United Auctions will welcome Lady Macdonald to their Annual Show and Sale of 9000 Blackface Wedder Lambs, Cross Bred Lambs and Feeding Sheep on Saturday, 10th September 2016. The visit to the event, recognised as the most important Blackface Lamb sales in Argyll, forms part of her role as “Lambassador”, supporting Quality Meat Scotland’s ongoing promotional activities behind Scotch Lamb PGI. The Queen of Cuisine will have the ‘farm to plate’ experience during her visit to Scotland’s leading livestock auctioneers’ facility in the West. She will meet farmers from Argyll and the Islands, view the quality of livestock on offer and present the James Weir Memorial Trophy for the best pen of Blackface lambs. And she will have the chance to taste and serve up Blackface Lamb rolls to customers at the Farm Assured mart, courtesy of Oban Spit Roast. The Lamb will be supplied from Farm Assured holding and regular customers Angus MacFadyen & Son of Bragleenmore Farm, by Oban – who are also competing for the trophy on the day – and sourced through Farm Assured company Jackson Bros. Master Butchers – Oban, who have a long association with the local farming community and United Auctions. Lady Claire Macdonald, who is internationally recognised as a leading advocate of Scottish food and produce, said: “I am really looking forward to my first visit to Dalmally Mart and to experience the wonderful atmosphere which accompanies such a large show and sale. “One thing which always comes through during these events is the pride farmers and auctioneers take in the quality of the livestock and stockmanship skills. United Auctions’ Annual Blackface Ram Sale at Dalmally Mart was “electric” on Saturday, October 11th as a top price of £40,000 was achieved in a ringside that was packed to the rafters. The sale topper was from renowned breeder Ian Hunter, Dalchirla, Crieff – who bred the record-breaking £90,000 tup sold at Dalmally in 2010 – for his second shearling through the ring. It went to three buyers J Wight & Sons of Midlock, M E McCall Smith of Connachan, Crieff and Troloss Farms, Elvanfoot. Next best was £20,000 from E MacMillan, Lurg Farm, Fintry sold to J Wight & Sons of Midlock and CC MacArthur & Co, Nunnerie. Nunnerie themselves topped the lamb ring to £16,000, selling four ways to JR MacGregor (Dyke) Ltd; Duncan MacGregor Ltd, Burnhead; HA Blackwood, Auldhouseburn, Muirkirk and J Murray, Crossflat, Muirkirk. By this point hungry farmers had already munched through 800 breakfast rolls while later they enjoyed fish and chips in the autumn sunshine and made good use of the marquee bar. Scotland’s leading livestock auctioneers sold 172 lambs to average £1021 (down £82 for 26 more sold) and 522 shearlings & aged rams to average £746 (down £38 to 37 more sold on the year). One local breeder who “got what he wanted” was John MacPherson of J & J MacPherson, Balliemeanoch, Dalmally. He was “delighted” when his first shearling through the ring fetched £5000 (pictured top), which was split three ways to S McClymont & Son, Tinnis, Selkirk, Burncastle Farming Company, Burncastle, Lauder and RF Lambie, Ashcraig, Selkirk and was “happy with the prices” for all stock forward in both rings. John is the third of four generations of MacPhersons farming around 1600 Blackfaces on 6200 acres near Loch Awe. He now works with his son Alec and was watched on at the sale by his father Ian, who is retired. Ian inherited the farm from his father (Alec’s great grandfather) John MacPherson and remembers coming to the Dalmally sales as a teenager in the late 1940s. If you have any old photos of Dalmally Mart in action, please email them to oldphotos@uagroup.co.uk or post a copy to Dalmally Market Photo Appeal, United Auctions, Stirling Agricultural Centre, Stirling FK9 4RN, including any information about the photograph, your name and contact details.